5 Fun Baby Shower Game Ideas and More! It is believed that baby showers started in the 1800’s. The games are timeless and help create memories for everyone involved. Especially for the mother or father to be. Baby shower games are exciting, because they can be simple, crazy or funny. Are you or someone you know having a baby? 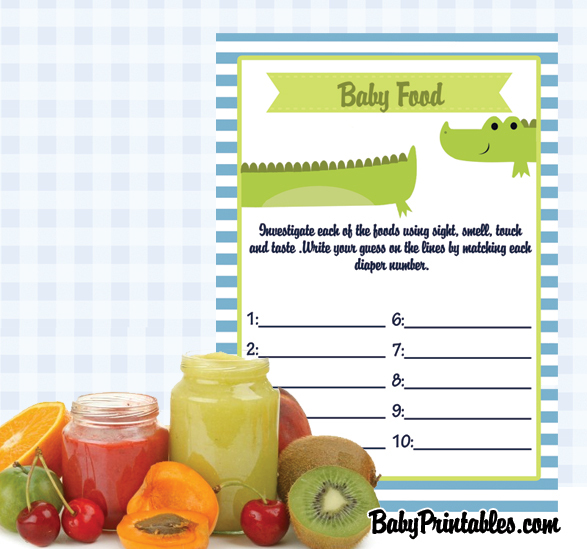 Are you looking for some fun baby shower game ideas? You are in luck, because here is a list of 5 fun baby shower games. Coming up with games for a loved one’s baby shower can be a hassle. That is why following this simple list of ideas will majorly help you along! These games are printable, easy to assemble, just print them on 110Ib white cardstock paper and cut them out! In all of these games, you will be able to mix and match them with your baby shower theme! You can also put your artistic talent to use and create your own design. Five baby shower games that are a must at any baby shower! How can you have a baby shower, without saying baby? Why not give it a shot? The basis of this game is that you will start out with some clothes pins. These can be any color or color coordinated with the baby theme. You can even decorate the clothespins on your own for a fun, creative and unique style to fit your baby shower needs. Every guest gets a clothespin, pinned on them. If you hear someone say “baby” during the baby shower, you take their clothespin. The person with the most clothespins wins the game. This game is very interesting and can be a bit messy, but still fun! For this game, you will take a diaper and number them for the amount of candy bars you have. So let’s say, one to six. Then you will melt candy bars in each one. You will take each diaper and try to figure out what candy bar was melted in the diaper. You can guess what is in each diaper by smelling, touching, seeing and even tasting. Put your guesses on the paper provided. Whoever has the most right, wins the game! Bingo is a classic game. Everyone loves bingo, so why not bring it into a baby shower? Baby shower bingo can be played in a variety of ways. One way would be to have the various options of gifts that can be received written out on a bingo card. Whenever the mother to be opens a gift, if that gift is listed on your bingo card, you mark it off. The first one to yell “bingo” wins. Another option for playing this game, would be to play it like regular bingo. 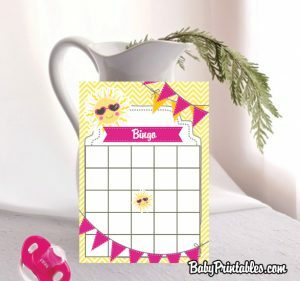 You have a card with baby shower related items written on them. Then you have a bucket to draw the items out of that are written down. First one to yell “Bingo” wins! This game is quite fun. For this game, everyone will get a card. You will have to have yarn and scissors available. Each guest will take the yarn (or in some variations, toilet paper) and cut the yarn to where they think it will wrap around the mommy’s tummy perfectly. If you would like, you can use a measuring tape and each guest can write down their guest. The closest guess wins! *Suggestion: If this is a coed baby shower, meaning there are dad’s around, this game isn’t for them. Maybe have them play “How many baby items can you name”. This game will test their knowledge as potential fathers. Or you can bring in some baby dolls and test the men on their diaper changing skills. All you will need is some baby dolls (which you can borrow from your friends who already have kids, who have baby dolls) and diapers. See what guy can change a diaper the best! Buy a mixture of jars of baby food. Make sure there are twelve different ones. Then you are going to take the labels off of each one. Label these jars one to whatever the amount of jars is that you get. Each person can guess what is in the jars and write them on their card. You can use your senses such as sight, smell, taste and touch. Make sure to mark the labels the same way and keep them somewhere as a guide. The person with the most amount guessed correctly wins a prize! These five baby shower games can help bring life and joy to any baby shower. 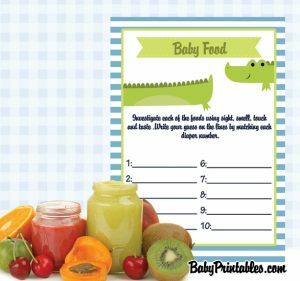 Your guests will have such a fun time with “Don’t say baby,” Baby Shower Bingo,” “Sweet Mess,” Guess Mommy’s Tummy Size” and “Guess The Baby Food!” You can use any variation of these games and they’re good for a baby boy or girl event. These games don’t have to be purchased as standalone items as they are part of a bundle of themed printable baby shower games offered on this site in multiple colors and designs. You can also use any of these games for fun dad-to-be versions! Coed baby showers are becoming more common nowadays! 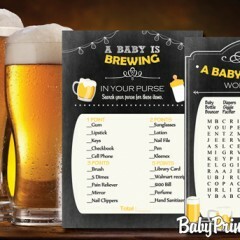 So if you are having a dad friendly baby shower, these games can be used for both! Another thing you can do with these is design your own pieces for each of the games to add an extra sense of personality to them. Make sure your guests prizes don’t take away from the mother to be and her gifts. Baby showers are a fun time to get everyone together to experience the wonderful miracle of childbirth. So have fun and enjoy your time together.